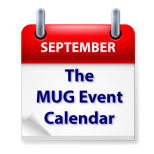 The week following a three-day weekend in the U.S. is often quiet on The MUG Event Calendar, but not this time. Joe Kissell will talk to a California group about “The Future of Macs in a Post-PC World”, and Maia Olson of Smile will tell an Illinois audience about TextExpander. A Texas group will learn about digital painting, and a Carolina group will talk about Social Networking. Other topics for the week include audio capture and music creation, Mac OS Sierra, WWDC, security, going paperless and more.